Accordion music began as a solo tradition. The left-hand buttons of the instrument sound bass notes and chords, while the right-hand buttons give the consecutive notes of a simple scale. Since one person could play both melody and harmony on the accordion, it could substitute for a more costly band of musicians. Hence, partially for economic reasons, but also because of its sweet vibrato, the accordion gradually replaced the violins and pitos as the preferred instrument for dance music in rural areas. 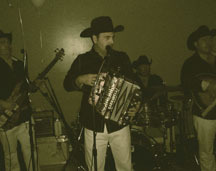 But because it was played around the ranchos for laboring people, the button accordion became associated early with working-class Tejanos. As more of them moved from the ranchos to the cities, the instrument was heard in the houses and cantinas of the barrios..
Conjunto La Aurora is pleased to offer its musical services throughout the California southland. "Remember the Old Days"